Looks like Reliance Retail is on a launch spree, the company has launched another LYF smartphone, dubbed as the LYF Flame 4 at Rs. 3,999. For now, the device is listed on LYF’s official website and will be up for sale via physical stores such as Big C, LOT Mobiles, and Poorvika. Interestingly, Reliance just launched a similar LYF Flame 3 at the same pricing. 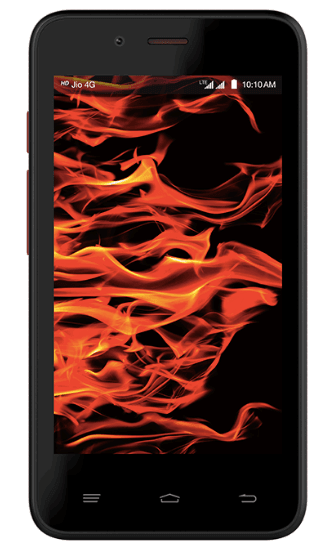 The LYF Flame 4 runs Android 5.1 Lollipop, and like the Flame 3, this one also features dual-SIM with 4G on both the SIMs. However, only one SIM can be used for 4G at a time. The LYF Flame 4 features a 4-inch (480×800 pixel) display and is powered by a 1.5GHz quad-core chipset clubbed with 512MB of RAM and Mali 400 MP2 GPU. In the photography department, the smartphone comes equipped with a 2-megapixel primary camera with LED flash, along with a VGA (0.3-megapixel) selfie camera. It bears 8GB of internal storage (expandable up to 32GB via microSD card). In terms of connectivity, the device supports 4G (with support for FDD-LTE Band 3 1800MHz and TDD-LTE Band 40 2300MHz) with VoLTE, Wi-Fi, 3G, Bluetooth v4.0, GPS, Micro-USB, FM radio, and 3.5mm audio jack. The device is backed by a 1400mAh battery, which is claimed by the company to deliver up to 4.5 hours of talk time, and 150 hours of standby time. The LYF Flame 4 measures 122.5×64.4×10.25mm, and weighs 117 grams. Somedays ago I go to Reliance Digital to checking out the LYF mobiles. I got simply stunned after in hand experience. The camera quality is unmatched, no other words. And other features are also good. And one model I choose to bye is about Rs.6500 with 4000 mAh battery. RAM may be 2 GB. screen 5.2. Just awesome. And their every phone even that price for Rs.4500 has awesome camera. Really good phones. If it’s Wind 4 then RAM is 1 GB and screen is 5″. Flame series seems to have some charging issue so better stay away. Without the preview offer though, these low end phones aren’t worth it.